Marcus Rashford has said he hopes to follow in Cristiano Ronaldo’s footsteps in terms of being a ‘constant threat’ for opposing teams to deal with. The 18-year-old has made an excellent start to his United career, bursting onto the scene last season under Louis van Gaal. Rashford netted a double on his Europa League debut, a double against Arsenal on his league debut and also the winner against Manchester City last season, turning him into an instant fan favourite at Old Trafford. Despite this, he still looks to improve his game, and said he will use the likes of Ronaldo and Rooney as examples to work towards. “In recent years Ronaldo is the example, wherever you put him in the attacking three he’s going to make an impact and the opposition are going to fear him,” he told Soccer AM. “Being a constant threat, that’s what I need to develop. 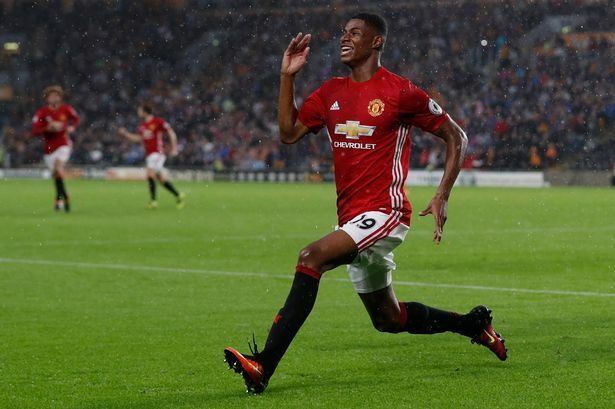 Rashford was on the scoresheet again last weekend in United’s 4-1 win over Leicester, and will look to continue his remarkably consistent scoring record against Stoke City on Sunday.